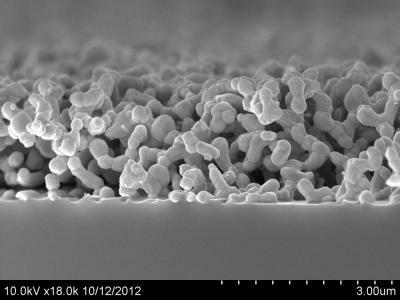 Scientists have created a heat-resistant thermal emitter that could significantly improve the efficiency of solar cells. The novel component is designed to convert heat from the sun into infrared light, which can than be absorbed by solar cells to make electricity – a technology known as thermophotovoltaics. Unlike earlier prototypes that fell apart at temperatures below 2200 degrees Fahrenheit (1200 degrees Celsius), the new thermal emitter remains stable at temperatures as high as 2500 F (1400 C). "This is a record performance in terms of thermal stability and a major advance for the field of thermophotovoltaics," said Shanhui Fan, a professor of electrical engineering at Stanford University. Fan and his colleagues at the University of Illinois-Urbana Champaign (Illinois) and North Carolina State University collaborated on the project. Their results are published in the October 16 edition of the journal Nature Communications. A typical solar cell has a silicon semiconductor that absorbs sunlight directly and converts it into electrical energy. But silicon semiconductors only respond to infrared light. Higher-energy light waves, including most of the visible light spectrum, are wasted as heat, while lower-energy waves simply pass through the solar panel. "In theory, conventional single-junction solar cells can only achieve an efficiency level of about 34 percent, but in practice they don't achieve that," said study co-author Paul Braun, a professor of materials science at Illinois. "That's because they throw away the majority of the sun's energy." Thermophotovoltaic devices are designed to overcome that limitation. Instead of sending sunlight directly to the solar cell, thermophotovoltaic systems have an intermediate component that consists of two parts: an absorber that heats up when exposed to sunlight, and an emitter that converts the heat to infrared light, which is then beamed to the solar cell. "Essentially, we tailor the light to shorter wavelengths that are ideal for driving a solar cell," Fan said. "That raises the theoretical efficiency of the cell to 80 percent, which is quite remarkable." This cross-section micrographs of a tungsten thermal emitter used in the experiment. Figure 2a shows how unprotected tungsten degrades after heating to 1200 degrees Celsius. Fig. 2b demonstrates how the ceramic-coated tungsten retained structural integrity after being subjected to 1400 C heat for an hour. So far, thermophotovoltaic systems have only achieved an efficiency level of about 8 percent, Braun noted. The poor performance is largely due to problems with the intermediate component, which is typically made of tungsten – an abundant material also used in conventional light bulbs. "Our thermal emitters have a complex, three-dimensional nanostructure that has to withstand temperatures above 1800 F (1000 C) to be practical," Braun explained. "In fact, the hotter the better." In previous experiments, however, the 3D structure of the emitter was destroyed at temperatures of around 1800 F (1000 C). To address the problem, Braun and his Illinois colleagues coated tungsten emitters in a nanolayer of a ceramic material called hafnium dioxide. The results were dramatic. When subjected to temperatures of 1800 F (1000 C), the ceramic-coated emitters retained their structural integrity for more than 12 hours. When heated to 2500 F (1400 C), the samples remained thermally stable for at least an hour. The ceramic-coated emitters were sent to Fan and his colleagues at Stanford, who confirmed that devices were still capable of producing infrared light waves that are ideal for running solar cells. "These results are unprecedented," said former Illinois graduate student Kevin Arpin, lead author of the study. "We demonstrated for the first time that ceramics could help advance thermophotovoltaics as well other areas of research, including energy harvesting from waste heat, high-temperature catalysis and electrochemical energy storage." Braun and Fan plan to test other ceramic-type materials and determine if the experimental thermal emitters can deliver infrared light to a working solar cell. "We've demonstrated that the tailoring of optical properties at high temperatures is possible," Braun said. "Hafnium and tungsten are abundant, low-cost materials, and the process used to make these heat-resistant emitters is well established. 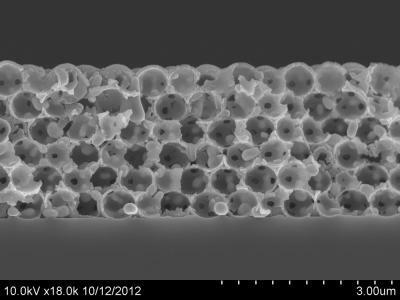 Hopefully these results will motivate the thermophotovoltaics community to take another look at ceramics and other classes of materials that haven't been considered."